Do you have a Dressage Test coming up? Want to ditch your caller (or commander) but just don’t have the confidence to know you will remember that test when the pressure is on? For some bizarre reason I can do this well! Remembering a test is the least of my problems on competition day. If you have difficulties with this it can increase the competition day stress factor considerably. 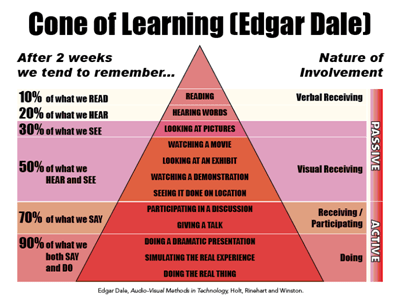 There’s a learning theory called ‘Edgar Dale’s Cone of Learning’ which reveals how we retain information when delivered in various styles. It shows you, at a glance, how we retain information from the activities we are involved in. This information is not only going to help you retain information for your dressage test, but help you to develop a strategy for remembering – full stop. 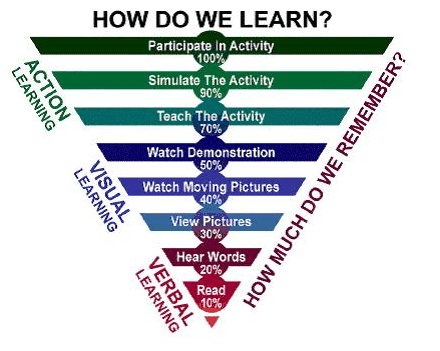 Generally, we learn actively or passively. Doing the task we are trying to learn: practice the various movements of the test during your training. For example: take the trot element and work through that, split the test into bite size chunks. Simulating the actual experience: Put the movements together and run through the whole test at home. Participating in discussion. 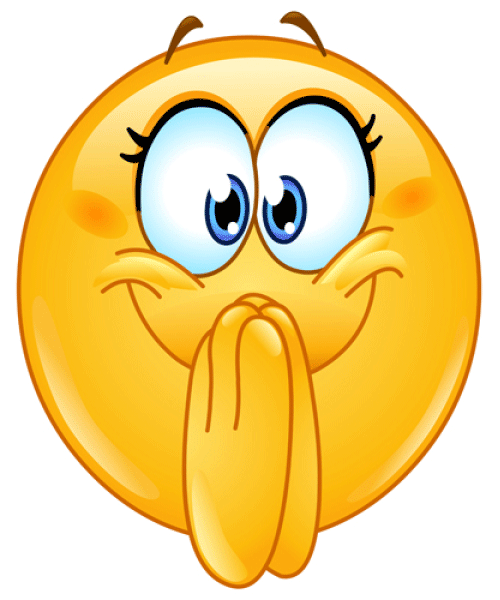 Talk through with your friends how you are going to ride the test and discuss any sticky points. I have an ‘accountability partner’ (if you have read The Crystal System Book, you will know why), we discuss our goals and achievements all the time, by talking through the test with her it helps cement it in my brain. … and so on, whilst doing this I think about bend, where my half-halts are going to be, how I prepare for each movement and visualise myself on the horse. I love it, I’m a little sad that way! Watching others. I often watch others on You Tube doing the test I am trying to learn. The laminated test plans with diagrams are really helpful. You can get them from the BD Website. Hearing words 1 – You can always read the test out loud to yourself. I recommend you do this at least once. It’s surprising how much you get from this, particularly if you read the requirements alongside each movement. This could be where your favourite iPod or MP3 player comes in handy. Dictate the whole test on your device, movement by movement so you can listen to it over and over. For the truly dedicated, you could also record it whilst riding so you can get the actual timing of the ridden test then it’s available to you to ride the test while listening to your iPod. Hearing the words 2 – Have a commander call out the test for you at home a couple of times during training. Reading – Obviously by studying the text of the test. For me, the magic lies in VISUALISATION. I sit quietly imagining the full blown experience. This way because I am a visual learner I don’t necessarily need to watch someone else doing the test, although I do find this useful, but more powerful is watching myself do the test … in my head. With the visualisation method I use, I rehearse in my mind, each movement, step by step, taking in my surroundings like I am really self assured. I am wearing full competition gear and painting a very vivid picture; creating a reality in which I feel great. I get 9’s for my riding and I soak up the feeling, holding it close for when I’m in the test. 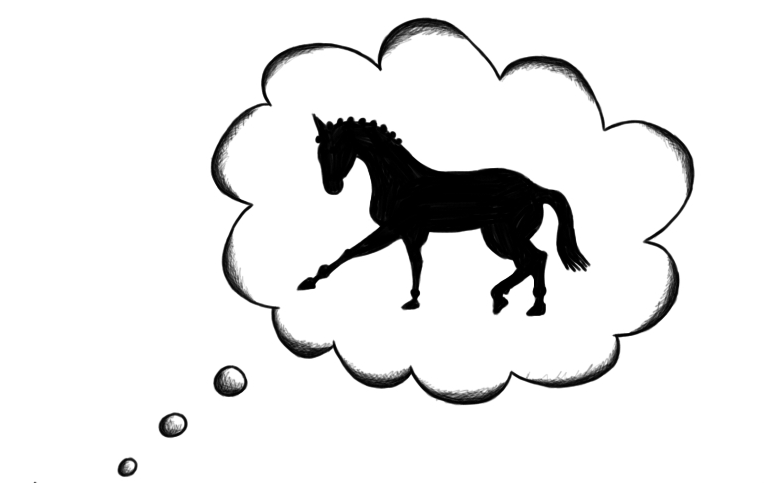 In this ‘dressage day dream’ I think about, where I prepare for each movement, what aids I am giving the horse, how the transitions feel and the reason I do this is because I feel that if I just thought ‘centre line, turn left, 20m circle’ I’d forget to ride! Every time you learn something new, your brain changes in a pretty substantial way, essentially, the more adept you become at a skill, the less work your brain has to do. Over time, a skill becomes automatic and you don’t need to think about what you’re doing. This is because your brain is actually strengthening itself over time as you learn that skill. Let’s quickly dig into some of the tried and true methods of learning new skills. It’s all about boosting your brainpower in one way or another. Thankfully, it’s surprisingly easy. This is an old technique, but it actually works really well for the busy lives most of us lead and is another of my favourites. Instead of sitting down for long periods of time, distributed practice is all about short sessions where you’re stimulating the link between the neurons in the brain more often throughout time. So throughout the day, every now and then I will ‘draw’ the test out with my finger on my thigh! Not really interested in accuracy here, more about remembering what comes next. I take 30 seconds to trace out the movements and then go one with what I was doing. In fact, I have a test next Thursday and I just stopped what I was doing and traced the pattern out on my thigh with my finger and then came back to the blog. The body’s internal clock is tuned to work better during certain points in the day, and that goes for learning too. Some of us learn best when we do so before sleep. Sleep can have a big impact on memory retention in general. When you learn a new skill before bed, you’re helping fortify the link between the neurons in your brain. This means you retain information better. It is a peaceful place, without any distraction and can be really beneficial. A word of caution though, you don’t want too much stimulation. A quick run through the test, maybe using a dry wipe board before bed-time can help. This assumes you can then switch off and sleep. Sometimes when I do this I can get carried away and can’t get the test out of my head, so it’s a no-no for me. As discussed in the ‘active approach’ section above, the process of learning through experience or in the case of the ‘passive approach’ ‘learning through reflection on doing’. Errrr, obvs! But more than that it is all about tracking what you’re learning, focusing on short learning sessions, practicing smart, not hard. Throw in really short bursts of learning the test in your training sessions, then move on to something else. Your subconscious kicks in to help retain the information. Start with pulling together the first few moves, or pick 3 parts of the test that are key. 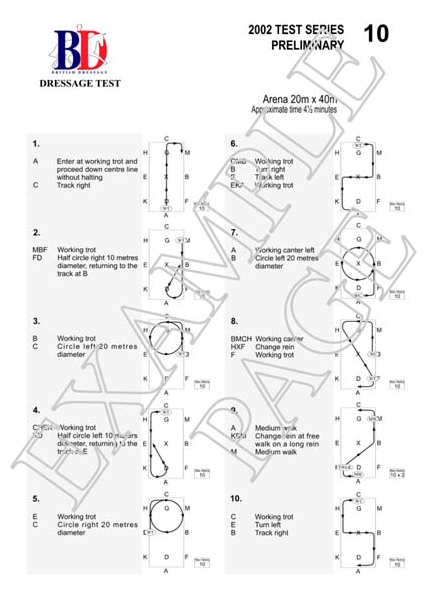 g. free walk pattern, change of rein in canter through trot pattern, movement before and after the medium trot. How do you learn your test? Action, visual or verbal? Got anything to add? 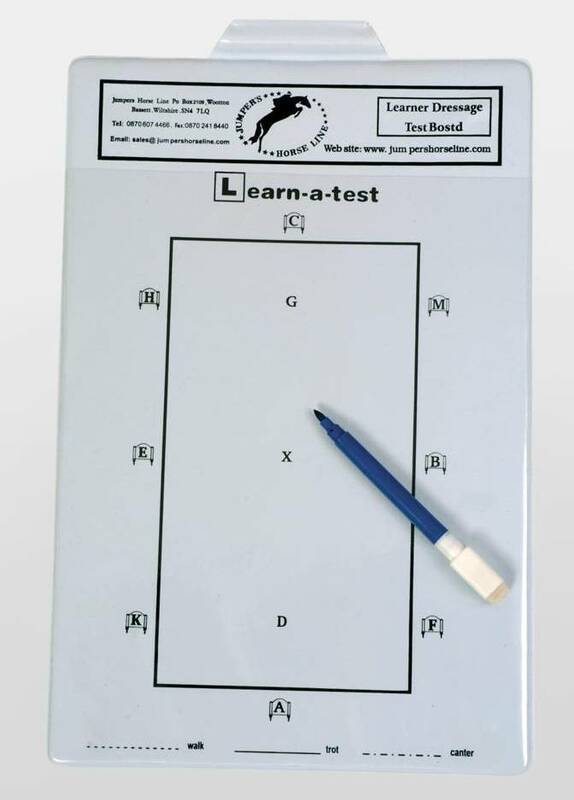 Your fellow dressage enthusiasts would love to hear from you if you have an innovative way of learning your tests.